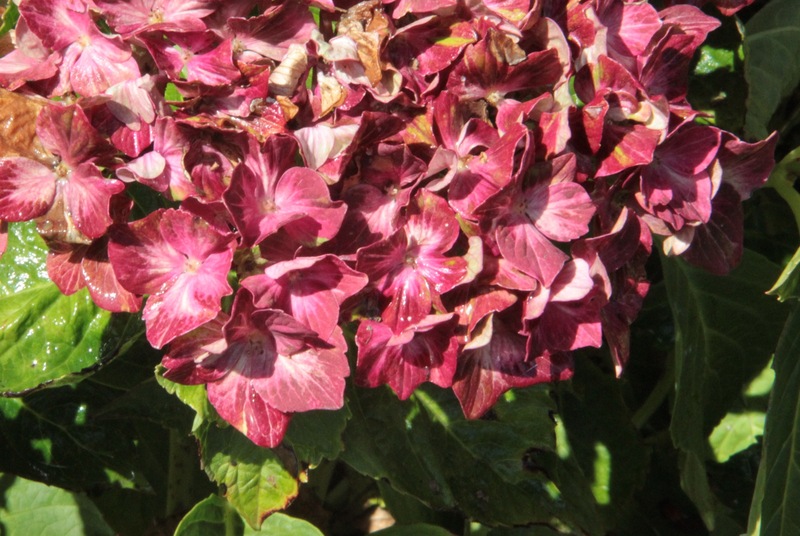 For two months, Coppertop’s hydrangeas have been providing color and interest despite some very warm, dry weather here in the Pacific Northwest. 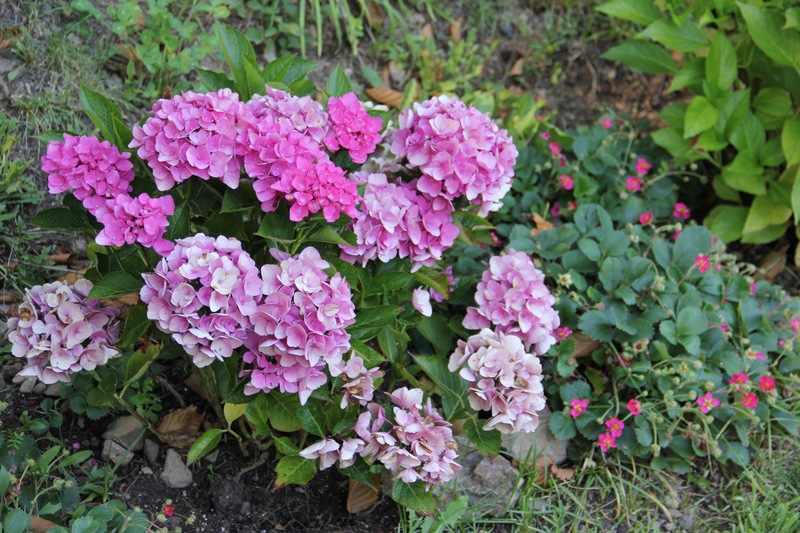 The varieties of hydrangeas are vast, and I love these no-fuss shrubs. One yearly pruning and they’re generally faithful bloomers. About a month ago I attempted to add aluminum sulphate to acidify the soil in this bed at the base of Chicken Hill to lower the pH and bring out the blues in some varieties. Instead of mixing with water, I watered the plants heavily then sprinkled the powder. The breeze didn’t cooperate, and I ended up requiring repeated eye flushing. Not fun! 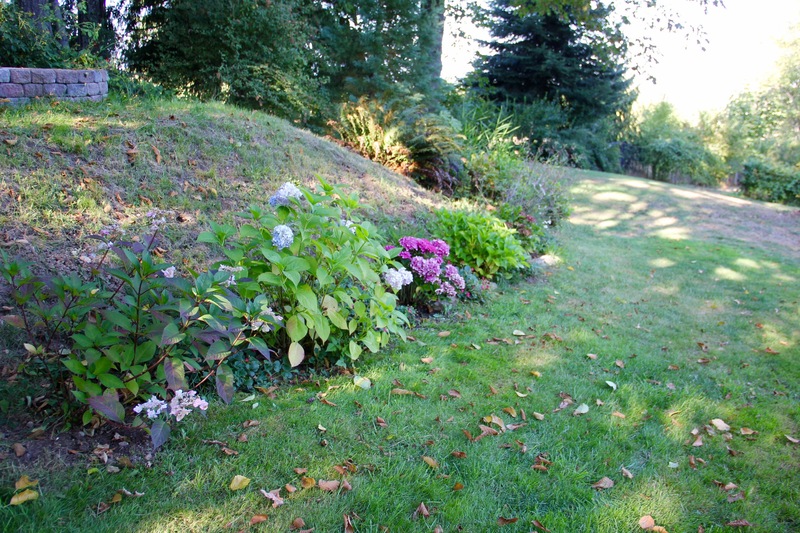 Bringing the ph down in soil may also be accomplished by adding lots of compost and mulching with acid-rich pine needles and bark. 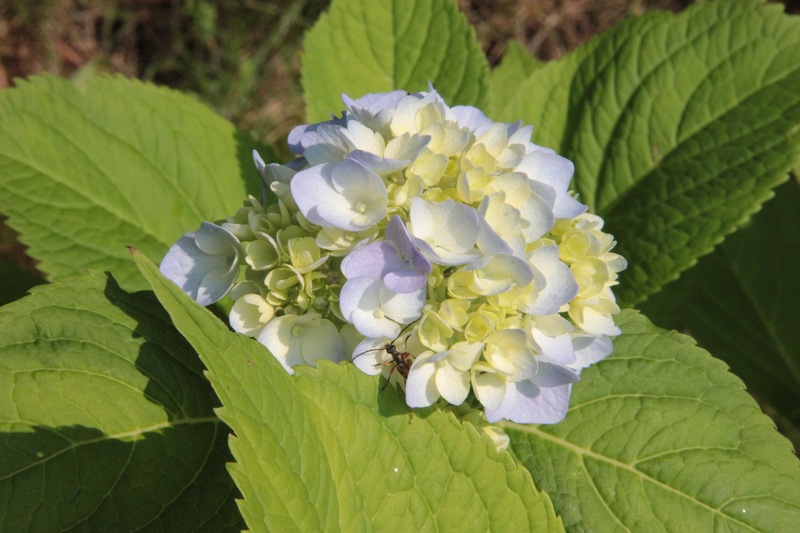 Some varieties won’t change color no matter how the soil is amended, in particular, white varieties. 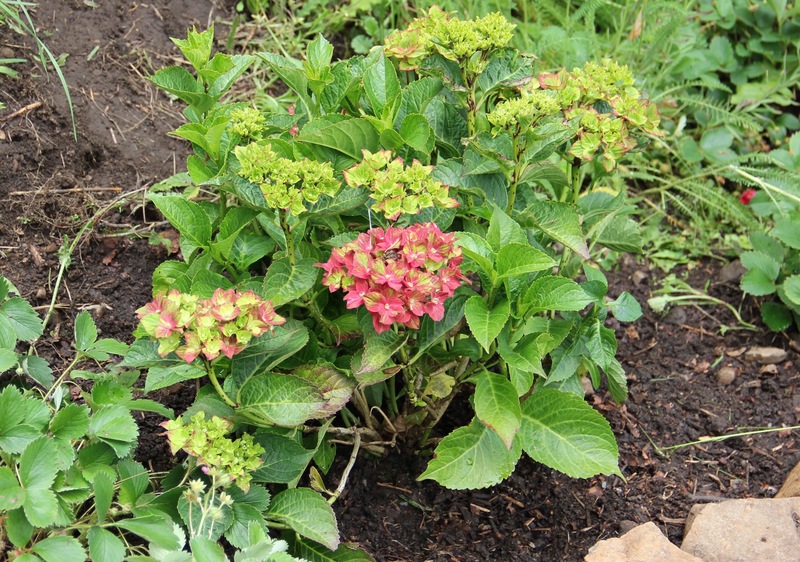 In June we added the below variety, “Pistachio,” to the row of hydrangeas. 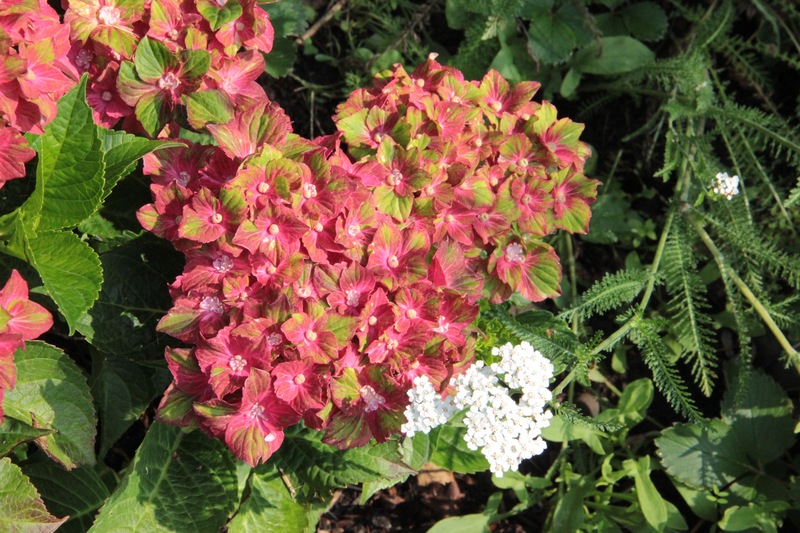 Our well water has kept these in glorious bloom, and they’re now beginning to turn a deep, rosy red. I hope to dry them and add to holiday arrangements. 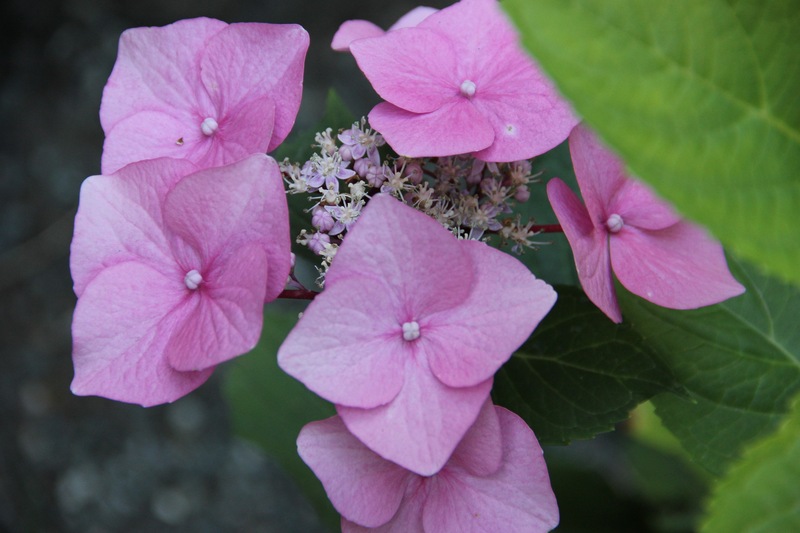 We also added the Venice variety which is going gangbusters, although still very pink. I dream of enriching the soil to turn it deep purple next year. 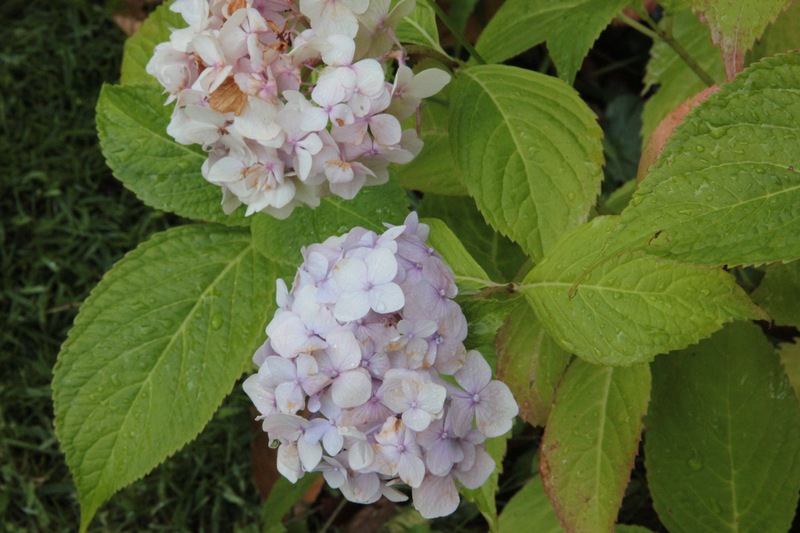 All the macrophyllas are beginning to dry on the bushes, and I savor the muted tones which point the way to the end of summer. Blossoms picked when freshly opened then kept in a glass of water indoors dry well without turning as brown. 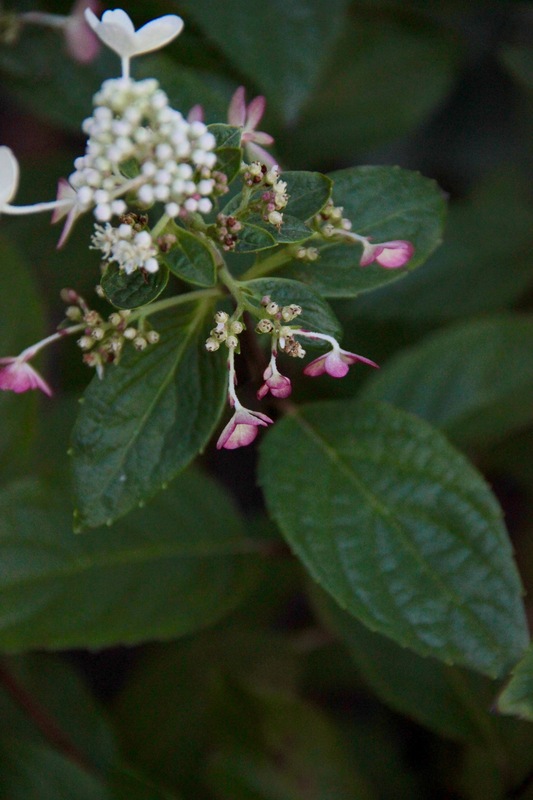 Our new Hydrangea paniculata PeeGee by the black arches has come into its own. Although I don’t remember it being tagged as a Pinky Winky, it does offer some soft rose color. 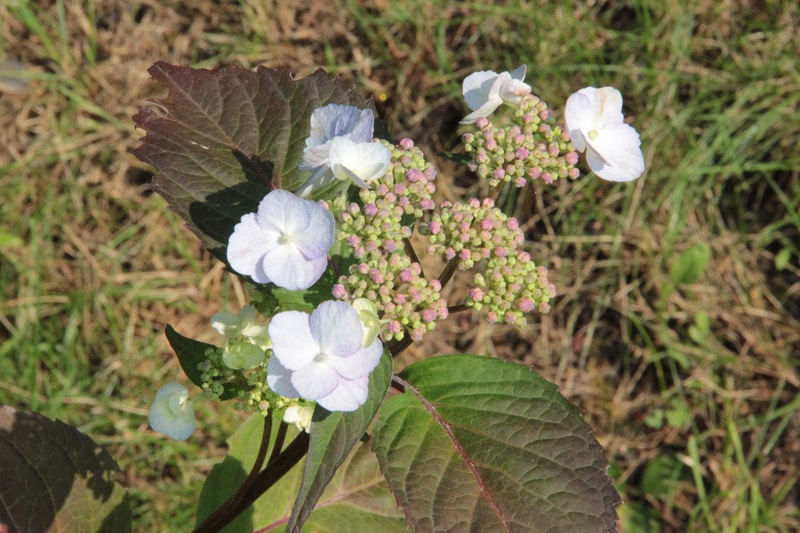 We saw no blooms but excellent growth on two oak leaf hydrangeas by the black arches which are just beginning to show signs of fall. I’ll hold off entirely on pruning these this year and see if that helps with blooms. 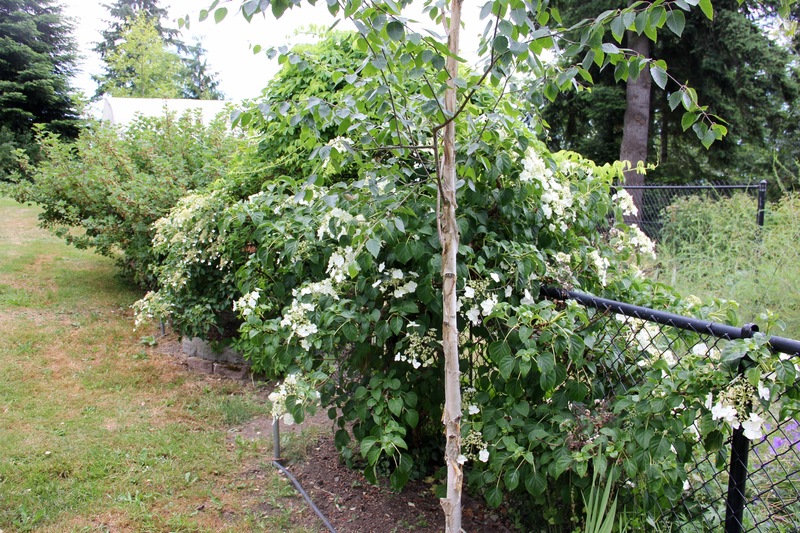 The climbing hydrangeas at the entry to the veggie garden have put on a great show for months. 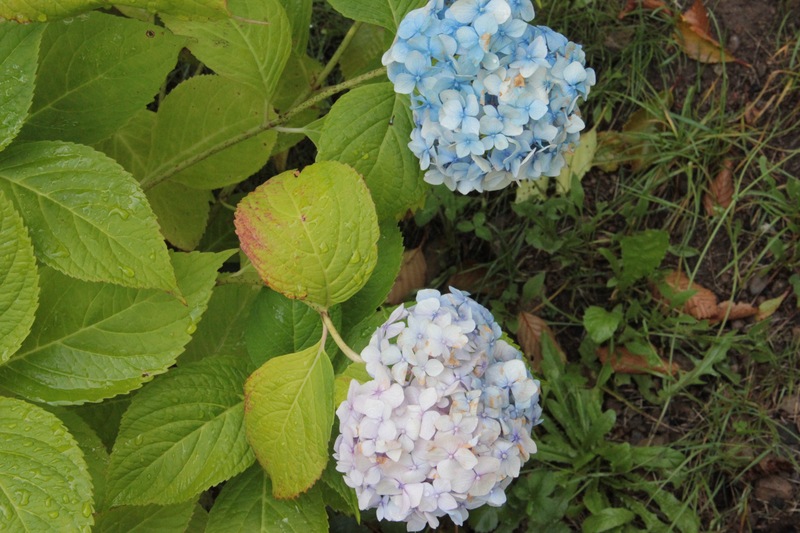 Three other hydrangeas at Coppertop aren’t doing as wonderfully, One large plant near the garden shed is struggling this summer, fighting with a huge grassy weed in its midst. Perhaps we need to dig it up entirely and free it from the aggressive weed then replant. 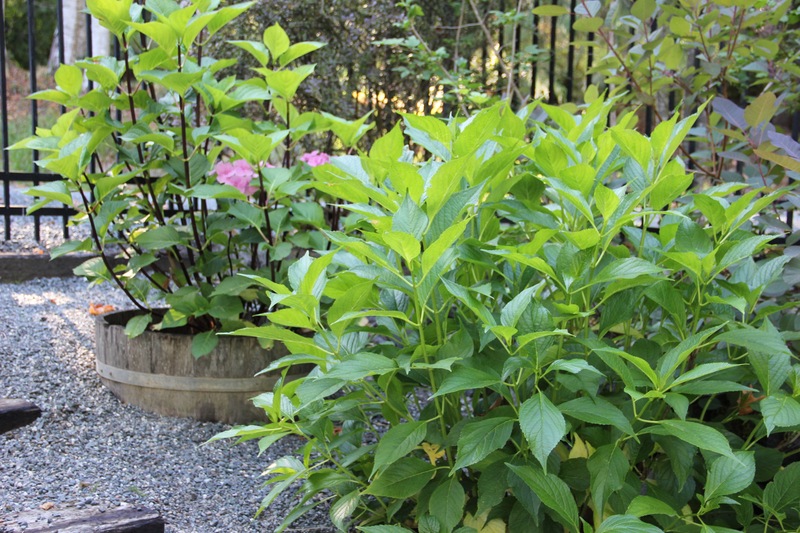 Of our two hydrangeas in whiskey barrels along the gravel stairway, just one has bloomed this year. I have no idea what’s up with the other, as its foliage is healthy and I’d thought I’d pruned it at just the right time. Apparently not. So much to learn! 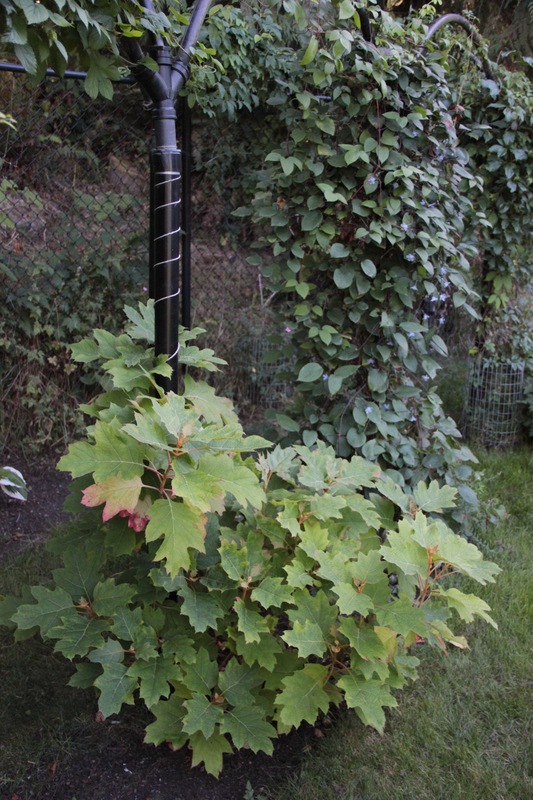 This entry was tagged cityline venice hydrangea, climbing hydrangea, gardening, hydrangeas, lacecap, mophead, oakleaf hydrangea, Olympic Peninsula, Pacific Northwest, peegee hydrangea, pistachio hydrangea. Bookmark the permalink. 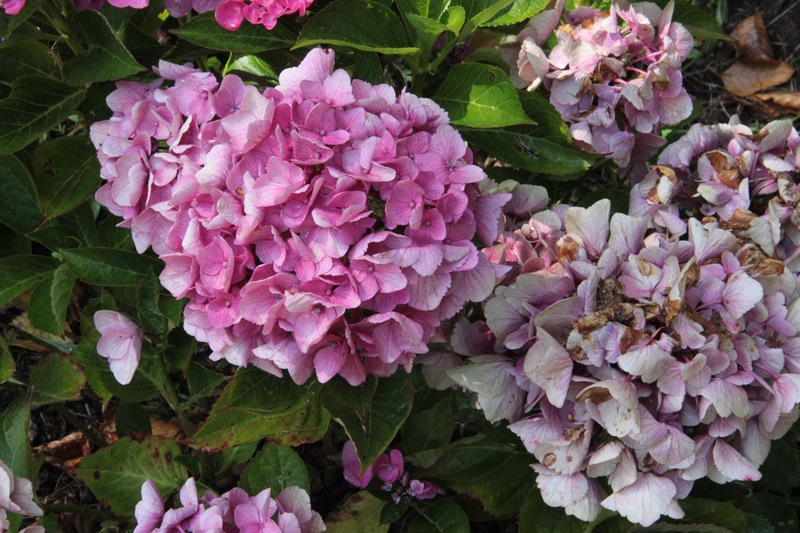 I love the hydrangeas, and thankfully I’ve never had a hydrangea eye-related injury….sounds nasty! 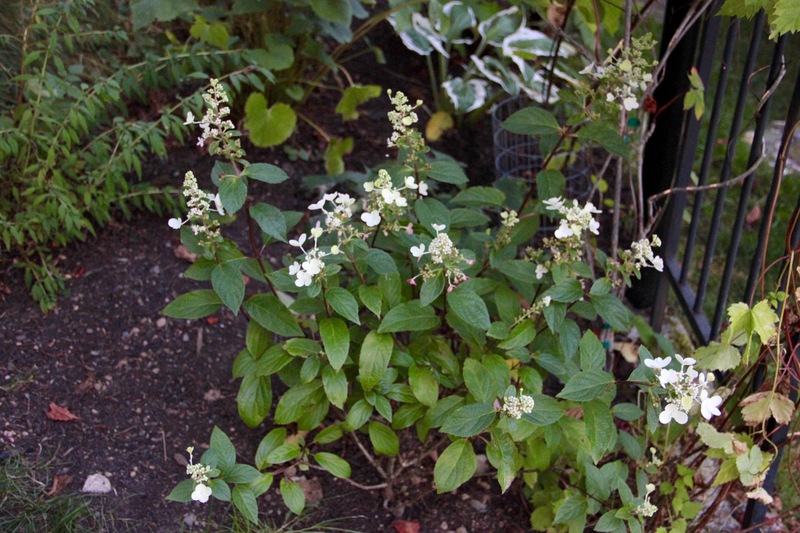 I believe with lace-caps, the pruning regime is to remove the flowers just as they’ve faded (whereas for other mop-type hydrangeas you leave them on over winter and prune just prior to spring) Either way, it isn’t a great concern as they will flower next summer!